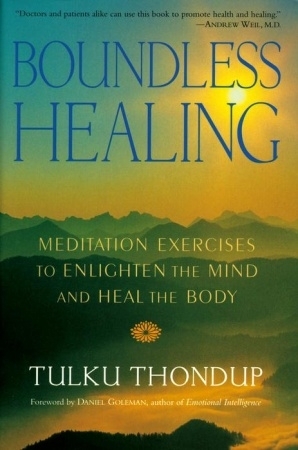 Using Buddhist principles as a basis, Tulku Thondup has created a universal guide that anyone can use. It will benefit those who want to preserve good health as well as those who need comfort and relief from illness or mental distress. This book offers simple meditation techniques to awaken healing energies in the body and mind, for all those who wish to become healthier, happier, and more peaceful in everyday life. Boundless Healing offers: Ways to employ the four healing powers: positive images, positive words, positive feelings, and positive belief Detailed healing exercises that can be done individually or as part of a twelve-stage program Exercises for dispelling anxiety Healing prayers for the dying and the deceased, plus advice for helpers and survivors. These meditations draw on our innate capacity for imagination and memory, our natural enjoyment of beauty, and our deep-seated longing for a state of quiet calm.